My aunt had a fancy dress party a few months ago to celebrate the demolition of their house in preparation for a new build. The party was themed ‘D’ for demolition. We decided that my sister Claire, a huge Doctor Who fan, would go as the Doctor. 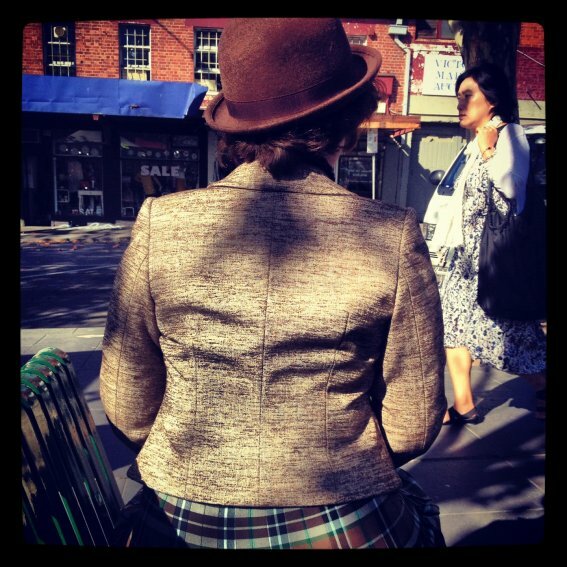 Specifically Matt Smith’s eleventh doctor, so she would need a tweed jacket. The time frame was short and I wanted to make something for Frances to wear as well, let alone my own costume. I thought that in order to quickly work up something that would fit Claire the best course would be to copy a jacket that she already owned, and not the way I would usually go about copying something. I wanted to avoid the sometimes slow (yet correct) path of taking measurements from the garment and working up the shapes in CAD, then printing them out and testing them before cutting good fabric. Because I wanted the pattern immediately (so impatient!) I pretty much traced the shapes off onto paper directly from the garment. I checked some key measurements and made sure the seams would fit back together, then added big seam allowances so that I could tweak it as I put it together. The jacket that I copied is more of a waistcoat with cap sleeves, so I had to adjust the shoulder and draft the sleeve and collar from scratch. But by this time I was really getting into sketching the rough pattern shapes and then checking a few key measurements, rather than traditional pattern drafting. I was being loose and creative and I’d be able to fudge my way around any issues when I was sewing it together! I’m an artist! The big seam allowances would save me anyway, wouldn’t they? Then there was the dilemma of the fabric. If I’m putting this much effort into something, I want it to be something nice that Claire could wear any day, not just a one off for a costume party. 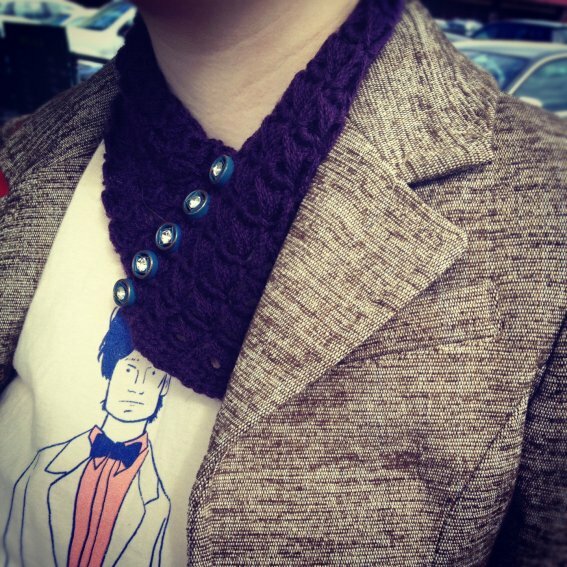 Then again, if I stuff it up, I don’t want it to have cost me a bunch in nice tweed. The shops solved this one for me. 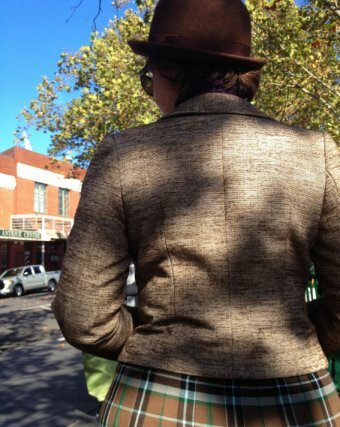 It turns out it’s not easy finding tweed quickly in Melbourne in February. Not mid to low priced stuff anyway. I ended up finding something that looked close enough and had the right sort of weight in the furnishing section of Spotlight. Only $12! And I used some patterned satiny stuff from the home collection for lining. It ended up taking me longer than I thought to finish it, because it seems I can’t really turn off the perfectionist that wants to reinforce everything properly and hand finish the tricky bits, but I got there in the end. Claire was the Doctor! She had a sonic screwdriver and everything (I had to make a jet pocket for the screwdriver of course). Now she still wears the jacket most days, so it is doubly successful! The only thing I think is not quite right is the armhole is a little tight, it really should have been dropped down a little further so she could get it on a little easier. I’m pretty happy though, given it was rushed and rough and fudgey! 06 May	This entry was published on May 6, 2012 at 2:05 pm. It’s filed under Projects and tagged clothing, Craft, Doctor Who, Fashion, Jackets, Patternmaking, Patterns, SciFi, Sewing, Tailoring, Tweed. Bookmark the permalink. Follow any comments here with the RSS feed for this post.